Goodreads is the world’s largest website for readers and book recommendations. 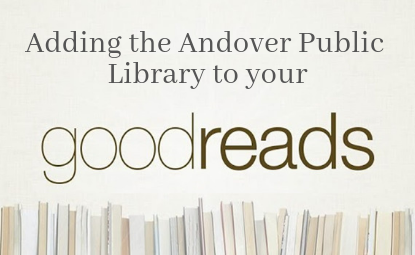 The Andover Public Library has a Goodreads group where you can discuss favorite books and find a new favorite by looking through our fun bookshelf categories. 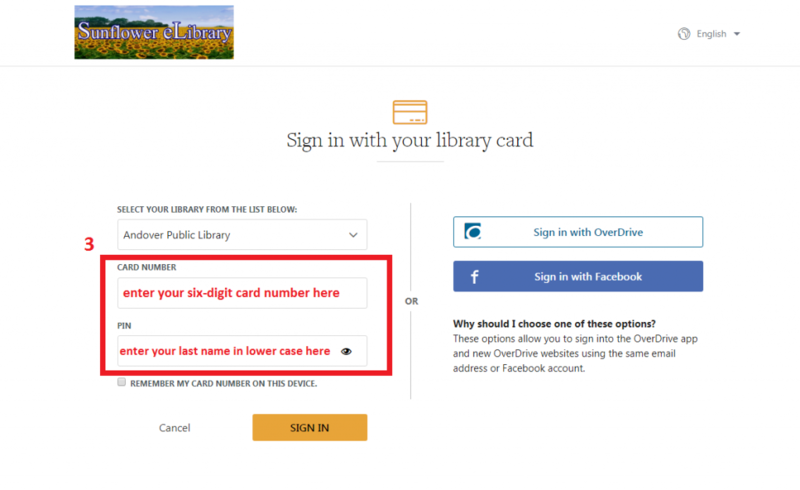 By following the directions below, you can connect your Goodreads account to the Andover Public Library’s catalog and easily see if we have a book and place it on hold. 1. 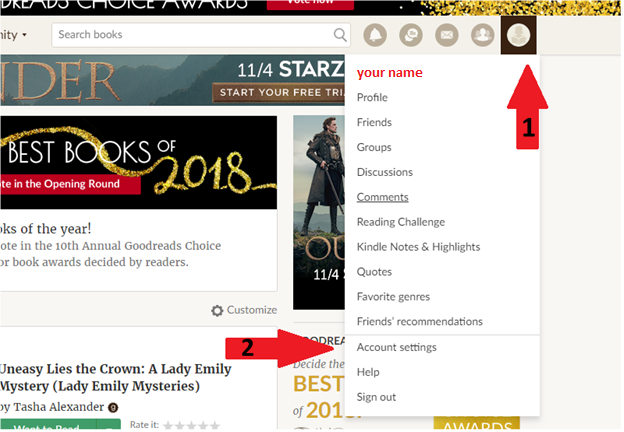 Click your profile button at the top right-hand side of your Goodreads page, at the far right of the search bar. This button either has a small image of a person reading a book or your profile picture. 2. Next, click on the Account Settings option. 3. Select Book Links at the top of the page. 4. Click Add a New Link located on the top right-hand side of the page, above the “Popular Links” section. 5. 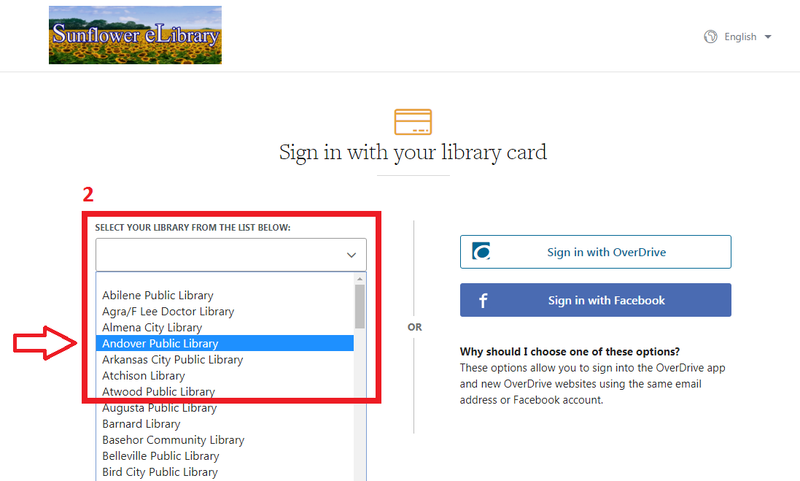 Type “Andover Public Library” into the top box titled Link Name. 7. 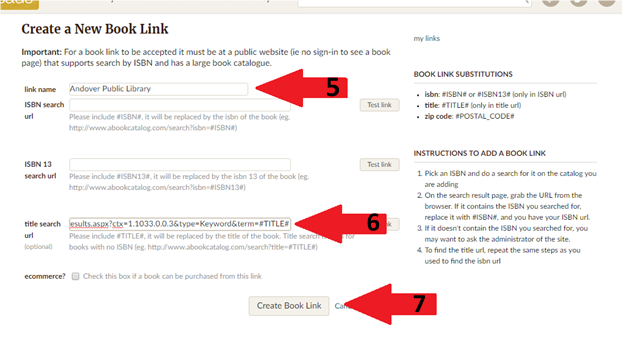 Click the Create Book Link button at the bottom of the page. 8. 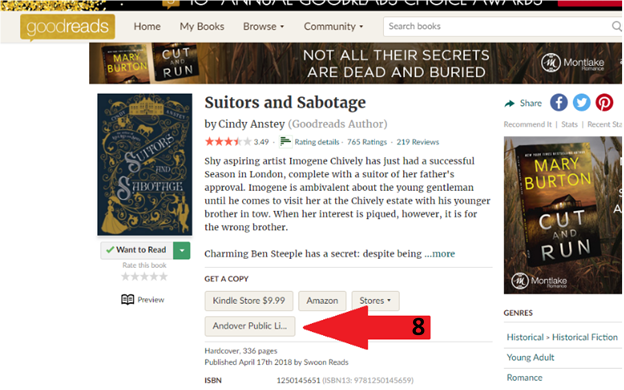 Finally, check any book the library owns on a Goodreads book page (ex: Suitors and Sabotage by Cindy Anstey). You will see a button titled Andover Public Library under the section called Get a Copy. 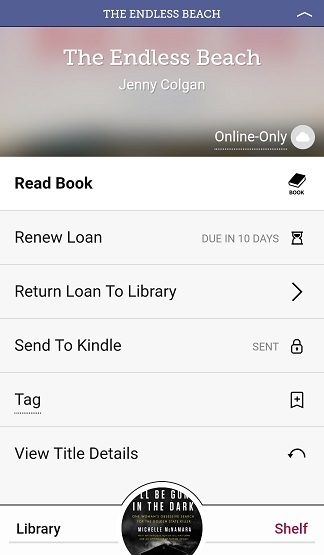 This button will link you to the same book on our library website so you can instantly place a hold! 2. 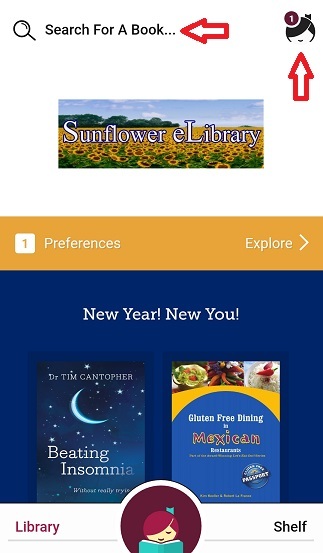 Select Andover Public Library from the pull-down menu. 3. Enter your six-digit barcode number from the back of your card. Your password is your last name in lowercase letters. 4. Once you’re logged in, you will see the Sign In button is now My Account. From here, you can view your loans and holds, see which items you have on your wish list, which items you’ve rated, and change your account settings. 5. To search for an ebook, audiobook, author, or subject/genre, select the Search button. 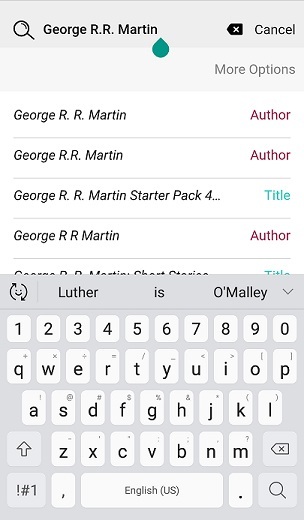 You can search by title, author, and genre! Interested in crime books? Search “Crime.” Interested in all books by John Grisham? 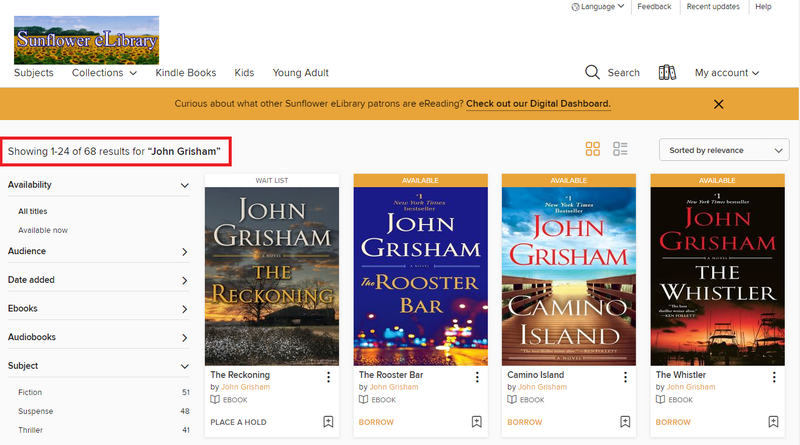 Search “John Grisham.” Interested in Regency romance novels? Search “Regency Romance.” Give it a try! 6. The search results will show audio and ebooks both. You can filter your search by selecting the categories to the left. 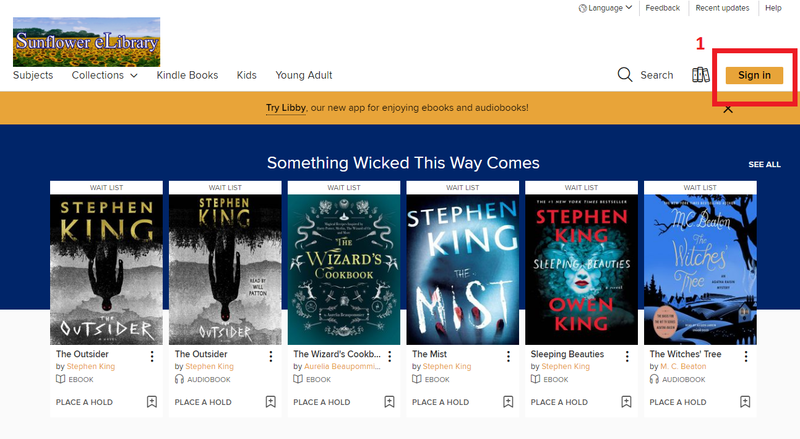 To search for all available titles, select Available Now under Availability. 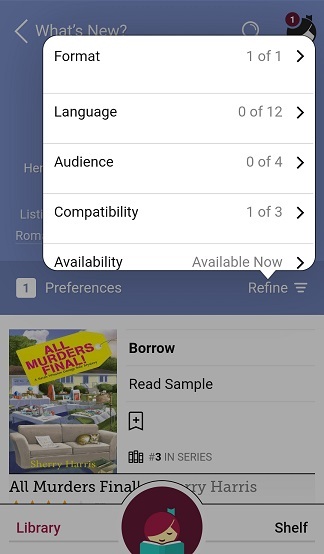 To limit your search to ebooks or audiobooks, select the appropriate item under Ebooks and Audiobooks. 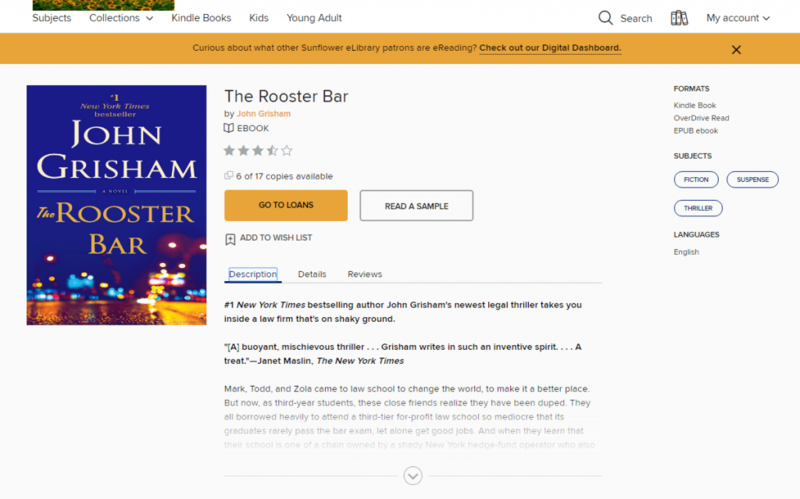 If an ebook or audiobook is available, an orange bar with the words Available will show at the top of the cover image (see “The Rooster Bar” in the image below). 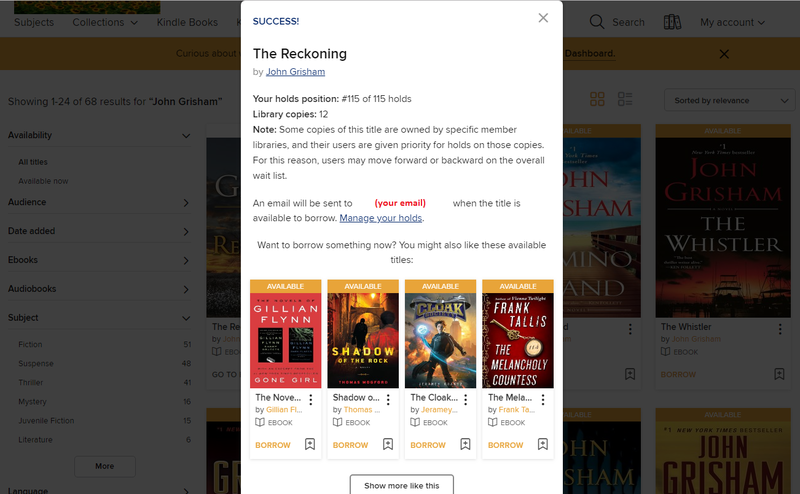 If a book is checked out, a white bar with the words Wait List will show at the top of the cover image (see “The Reckoning” in the image below). 7. To find out more information about a book, select the book’s image or title. This will allow you to read a short description of the book, see what formats it is available in, read a sample, and either check the item out or place it on hold. 8. 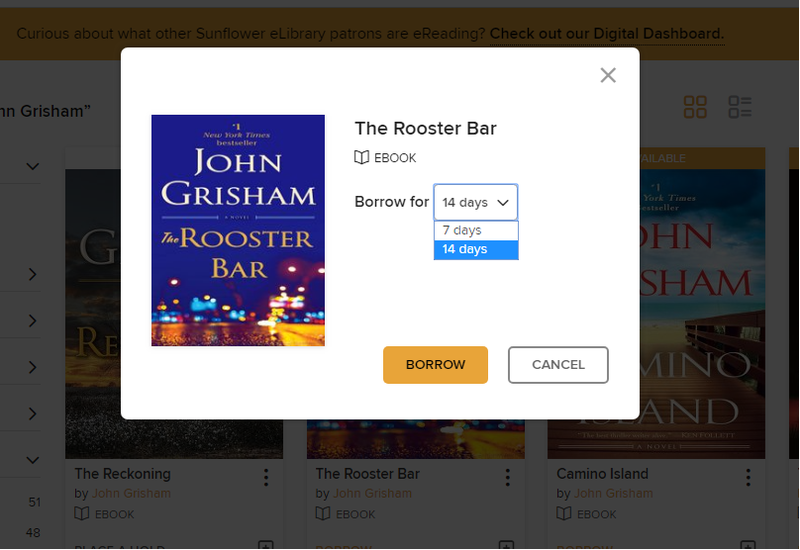 To place a hold on an ebook or audiobook from the search screen, select the Place a Hold button below the title. 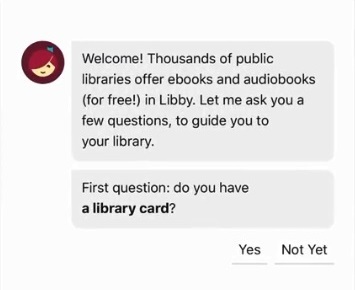 The pop-up notification will show you where you are in line for that item and how many copies the library owns. You will also see several “read-a-likes” that you might want to check out! When the item is available, you will receive an email. 9. 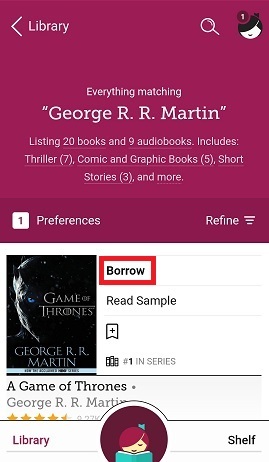 To check out an item from the search screen, select the Borrow button below the title. Choose whether you’d like the item for 7 or 14 days and again select Borrow. 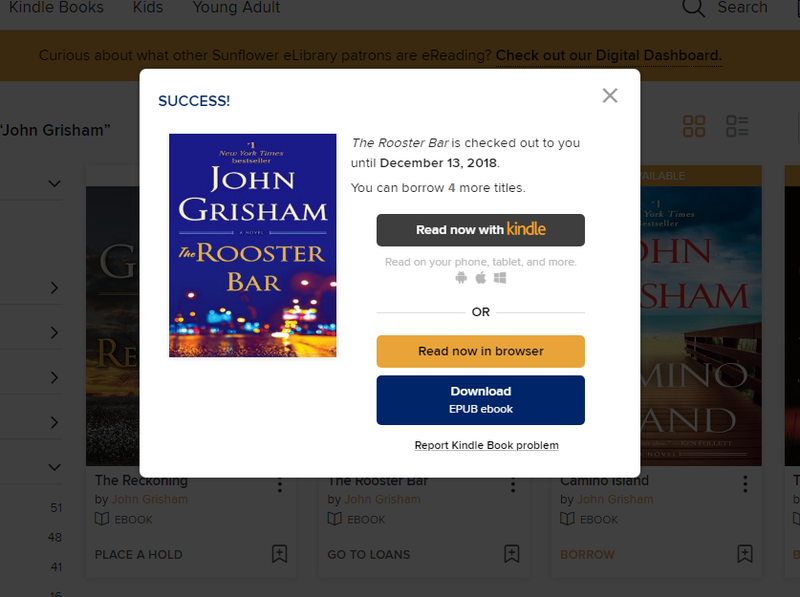 You have the option to read the ebook in the browser, download an EPUB version, or read with your Kindle. 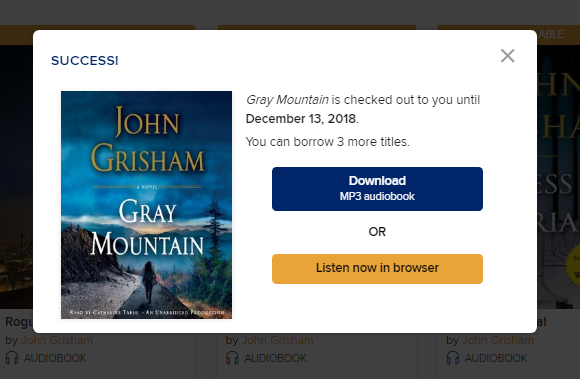 With audiobooks, you can listen in the browser or download an MP3 version. 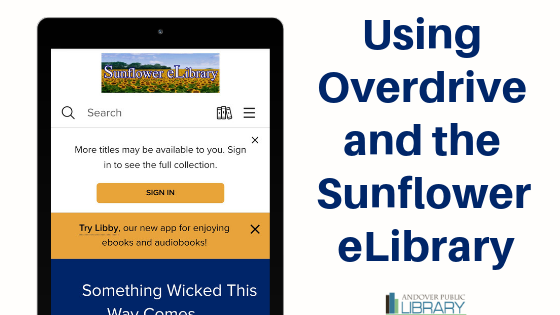 Should you have any questions about using Overdrive and the Sunflower eLibrary, APL staff are always happy to answer questions.